here is no better way to enhance the look and performance of your bathroom other than to install a great showerhead. 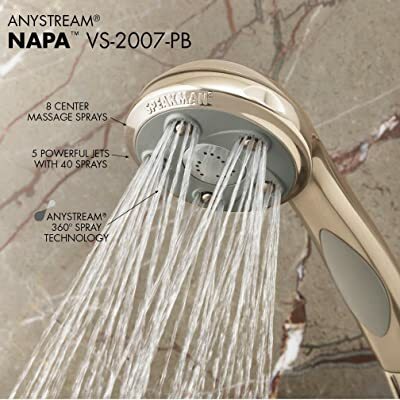 Speakman Napa VS-2007-PB 2.5 Gpm Multi-Function Hand Shower Head is a wonderful option. From design to performance to installation, this multifunction showerhead has all it takes to make it to the top list of the best hand held showerheads currently in the market. This is yet another unit from Speakman to make it to this list of ten. Just as is the case with number 7 above, this showerhead uses the exclusive and patented Anystream® 360 technology for easy switching from one shower pattern to another. It has a 60-inch metal hose with a bracket; all constructed using Speakman® engineered plastic. Speakman Napa VS-2007-BP is designed to provide pressurized water flow while at the same time conserving water to reduce your water bills. It features patented Anystream 360-degree technology, which enhances versatility. With a simple rotation of the showerhead’s faceplate, you can change/transition between massage, intense as well as combination spray patterns each of which is highly soothing and powerful. It offers up to 50 customizable sprays. The disadvantage of ordering this unit is that it does not come with a user guide. That might be a big issue for people who do not know how to install a handheld showerhead. Furthermore, it shares a disadvantage with the Speakman VS-3014 in that they both have a tendency of reducing water pressure to less then 2.5 GPM, and that might be a less satisfactory pressure considering the normal plumbing standard is 2.5. Just like the other modern handheld and combo showerheads, this unit is extremely easy to install. It does not require any plumbing skills or any specialized plumbing tools. Each package comes with instructions on how to install this bathroom fixture in the shortest time possible. To ensure perfect installation however, you may need certain tools such as adjustable wrench or pliers, Teflon tape, safety goggles, rubber sealing washer and terry cloth among other. This showerhead looks extremely elegant and can complement any bathroom décor if installed. It is designed for modern as well as transitional bathrooms. It gives a touch of luxury and delivers top of the range showering experience. Furthermore, its unique faceplate with modern ability gives it unrivalled design yet to be matched by any other brand currently in the market. You will simply love it. The showerhead is capable of delivering up to 50 customizable sprays for flexibility and diversity of showering experience. It is extremely easy to install; all you need is to follow the instructions on the provided user manual. The showerhead is designed to be compatible for both modern and transitional décors. It features patented plungers to optimize water pressure while conserving water at the same time. This unit is made of chrome, a plastic that may not be as durable as metal. The brass finish fades quickly giving the bathroom an old appearance. Speakman has been in business for over a century and the brand is known to produce high quality plumbing materials and bathroom fixtures. It offers good performance, easy to install and with an alien technology only seem with this model. It will enhance your bathroom décor because of its wonderful modern and traditional appeal.